Manatees also known as sea cows have been on the edge of extinction for over 70 years, they were once hunted by people for there meat but since this idea have been discarded and now manatees are protected by the several countries. Living in warm shallow waters they feed on plankton and seaweed on the sea bed unfortunately the manatees kept getting caught in lost sea nets. Accurate population estimates of the Florida manatee are notoriously difficult and have been called scientifically weak, with widely varying counts from year to year, some areas showing possible increases yet others with decreases, but with very little strong evidence of increases except in 2 areas. However, population viability analyses studies carried out in 1997, found that decreasing adult survival and eventual extinction is a probable future outcome for the Florida manatees, unless they are aggressively protected. Manatee counts are highly variable without an accurate way to estimate numbers, for example, in Florida in 1996, a winter survey found 2,639 manatees, in 1997 a January survey found 2,229, but then a February survey found 1,706 Fossil remains of manatee ancestors show they have inhabited Florida for about 45 million years. 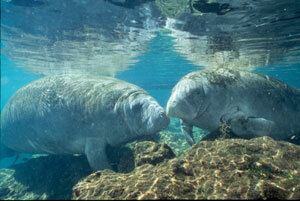 They are mainly herbivores, spending most of their time grazing in shallow waters and at depths of 1-2 metres (3-7 ft). Much of the knowledge about manatees is based upon research done in Florida and cannot necessarily be attributed to all types of manatees. Generally, manatees have a mean mass of 400-550 kg (900-1200 lb), and mean length of 2.8-3.0 m (9-10 ft), with maximums of 3.6 meters and 1,775 kg seen (the females tend to be larger and heavier). When born, baby manatees have an average mass of 30 kg.